Some things don’t seem to change with time. Years of technological advance, escalating ticket prices and customer-focused-integrated-deregulated family-friendly summer rail travel still ends up with cluttered corridors full of sweaty travellers sitting on groaning backpacks. My journey down to Plymouth took 13 hours, mostly in one of those trains that has increasing undertones of a mobile portaloo as it progresses through the day. But I’m not really complaining, I got the seat next to a power socket and managed to do a day’s work; so many people around … but no one to distract me. Back south, I was struck by a big photograph of a basking shark on the front cover of the Western Morning News. This is a regular feature in the summer in a newspaper that often features fishermen complaining about the unfairness of current regulations and the attempts by conservationists to steal their livelihoods with conservation zones for valueless sea grasses and the like. 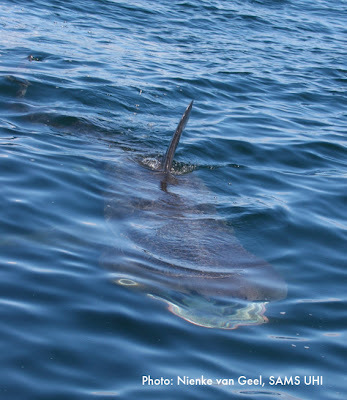 But basking sharks are different, they eat plankton and don’t compete with fishermen and, like the first cuckoo in spring, give reassurance that all is somehow well and the summer has arrived. I remember when I saw my first basking sharks in Plymouth Sound, steering the University of Plymouth Marine Institute’s yacht Fairtide at a safe distance so as not to disturb these extraordinary 30 foot animals. Awesome. Some years later, under sail in my own boat Ettrick, I came across a shoal of thirty or more basking sharks between Mull and the Treshnish Islands on a stormy day. My seasick daughter who was huddled in a corner of the wheelhouse was instantly revived by the sight of these animals (and later by a killer whale) seemingly milling around us randomly as they fed in waters peppered with puffins and guillemots. This year, colleagues spotted them near the island of Kerrera, just across the bay from Oban. No matter how many times you see them, there is always a sense of excitement (at least that’s what I feel). One of our colleagues, hiking on Skye, was so excited to see them that he jumped into the water to swim alongside! But it wasn’t always that way. Just after the Second World War, the 31 year old Scottish author and naturalist Gavin Maxwell purchased the island of Soay near Skye and established his ill-fated shark fishery and factory. The whole enterprise was a disaster, misguided and poorly planned. It seems extraordinary to us today that a celebrated naturalist should be harpooning basking sharks and that most of them ended up rotting on a tiny Hebridean island. He made more money from his book ‘Harpooning at a venture’ than from the fishery. We took Ettrick across the sand bar into the little natural harbour in the now deserted Soay. The stone house and quay built by Maxwell are still there, together with the macabre rusting boiler where oil was supposed to be extracted from the carcasses. Everything, apart from the dense and savage clouds of midges, was eerily still and silent. Basking sharks, only exceeded in size by whale sharks, have huge livers that form around 25% of their body weight. The shark liver oil was unmarketable in the UK due to a high concentration of squalene (ironically now highly valued) but other shark products were sold, particularly shark fins for the oriental market. Maxwell’s disastrous exploit was small in comparison to Irish and Norwegian fisheries though. I have plotted the data (from Kunzlik, 1988) from the three fisheries on the graph and you can see how the Irish and Norwegian fisheries went through boom and bust. Whatever you think about fishing these animals, the fact remains that they have quite low birth rates, distribution and migratory behaviours that are still not entirely clear, and became severely depleted by the 1990s. At this point I have to mention a political irony. Before Elliot Morley wrecked his political career in the House of Commons expenses scandal, he had been the Environment Minister who personally championed the cause of protecting basking sharks. Almost ten years ago on 15 November 2002 he was in Chile attending the conference of parties to the Convention on International Trade in Endangered Species (CITES) to lead a UK sponsored motion to protect basking sharks. This was by listing them under CITES Appendix II - the category for species not immediately threatened with extinction but which may face it if trade is not carefully regulated through a system of CITES export permits. At that time, basking shark fins could be sold for up to $15,000. After much debate the UK motion fell short of the necessary two-thirds majority by two votes. Intense late night lobbying followed and a new vote at the end of the meeting secured the motion and there was an additional successful vote to protect whale sharks. But have this and the other local measures worked? 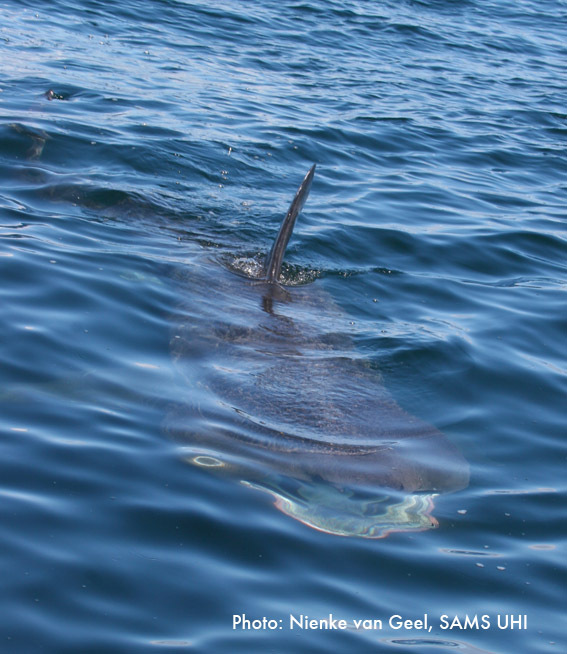 Arrivals of shoals of basking sharks are so irregular that it is difficult to determine trends. 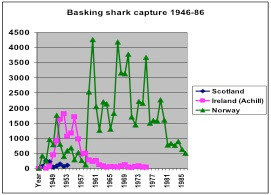 Matthew Witt and colleagues from the University of Exeter’s Falmouth campus have recently published a review of all data from shark sightings in the UK, some 11,781 records plus their own tagging experiments in Scotland. They conclude that the species is indeed recovering from over exploitation and that there is a “significant correlation between the duration of the sightings season in each year and the North Atlantic Oscillation”. And the West coast of Scotland is indeed the hot spot for the species in UK water so we can probably look forward to more sightings in the future. In the year that Elliot Morley and colleagues were lobbying for the basking sharks, delegates in Johannesburg were busy with the Rio+10 conference, not deemed very successful except for its strong declaration on the oceans. They agreed to establish a globally coherent network of marine protected areas by 2012. This year the deadline has been ‘kicked down the road’ by another decade. The lesson from the basking shark is that we need champions in high places if effective measures are to be taken to protect and sustainably use our seas. But who will step forward in a world preoccupied by our own economic boom and bust?